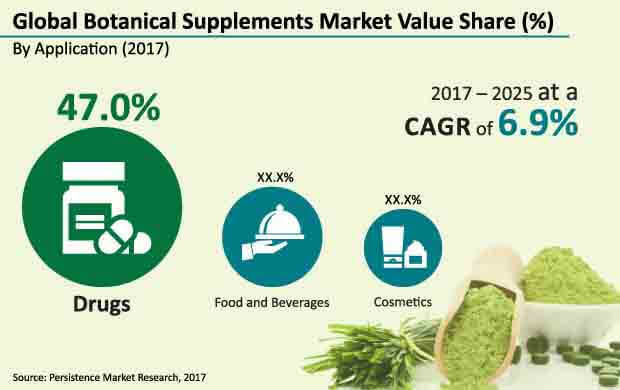 Botanical Supplements Market Segmented By Application – Drugs, Cosmetics, Food and Beverages; By Demography - Adult Women, Adult Men, Baby Boomers, Others. Revenue from the global botanical supplements market is estimated to be valued at more than US$ 40 Bn in the year 2017. By 2025 end, the global botanical supplements market is expected to reach a market valuation in excess of US$ 65 Bn, registering a CAGR of 6.9% over the forecast period (2017–2025). Rising awareness among consumers regarding the health benefits associated with consumption of botanical supplements such as holy basil extract, which helps in reduction of anxiety is a major factor expected to drive growth in demand for botanical supplements. Owing to increasing advertisements and easy availability of botanical supplements over the counter, demand for these supplements is increasing. Currently, consumers are more inclined towards self-medication due to rising penetration of internet and social media. These factors are expected to drive growth of the market for botanical supplements globally over the forecast period. Due to hectic schedules and changing lifestyle patterns, there is a steady increase in the incidence of lifestyle diseases such as diabetes, obesity, and high blood pressure. Thus, consumers are taking preventive measures for reducing the effects of lifestyle diseases. Owing to the inherent disease preventing properties such as slowing down digestion and absorption of carbohydrates, botanical supplements are a healthy alternative to prevent and reduce the effects of lifestyle diseases and this is supplementing revenue growth of the global botanical supplements market. Lack of stringent norms and regulations pertaining to the safety and efficacy of botanical health supplement products is a factor expected to affect the growth of this market globally. Owing to less emphasis on labeling and safety of these products, incidences of false health claims by manufacturers in order to market their products has increased significantly. These factors have impacted consumer outlook towards botanical supplements and this is expected to adversely affect the growth of the botanical supplements market to a certain extent. In December 2016, Patanjali Ayurved (an India-based herbal supplement manufacturer) was fined US$ 18,000 for misleading product advertisements. Major players in the health supplements market could focus on collaboration with regulatory bodies to strengthen safety norms for health supplements. Regulatory bodies are focusing on imposing various safety norms for manufacturing and marketing of botanical supplements. The European Food Safety Authority has passed a regulation regarding certain nutritional claims for some botanical substances and this list of botanical substances was issued in December 2012. Key players can focus on offering labeled and safe products. Several manufacturers have started adopting GMP (Good Manufacturing Practice), which could help in changing the outlook of consumers towards botanical supplements. The Drugs segment by application is estimated to account for a value share of 47.0% and be valued at nearly US$ 19 Bn by the end of 2017. The Cosmetics segment is projected to witness a relatively high growth rate, registering a CAGR of 7.2% in terms of value and is expected to gain 46 BPS in 2025 over 2017. Increasing geriatric population in developed countries such as U.S. and Japan has led to significant expenditure on healthcare services. As a preventive health measure, the geriatric population is inclined towards using alternative medicines due to little or no side-effects. Botanical supplements are preferred by the ageing population, thereby driving botanical supplements market growth. In 2014, according to a population survey in the U.S., about 65.2 million people have reached 65 years of age and are inclined towards using personal healthcare products. This offers lucrative opportunities to botanical supplements manufacturers to offer botanical extracts based products in the personal healthcare segment. The Nature 's Bounty Co.
Nature’ s Way Products, LLC. Bio Tae Extratos Vegetais Ltda.